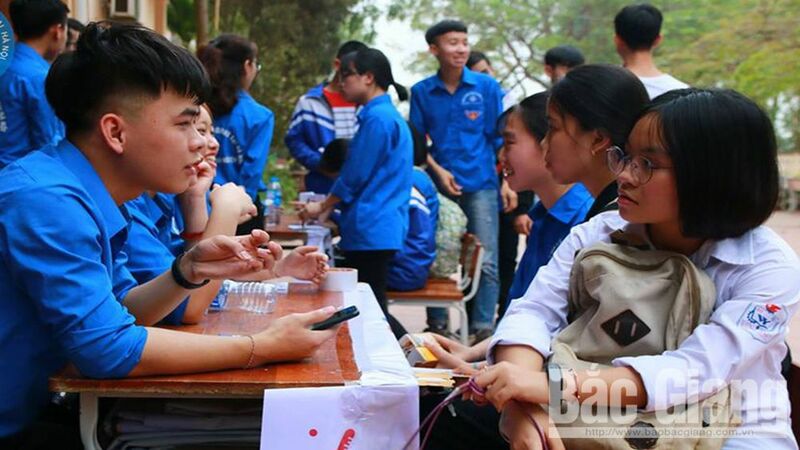 (BGO) – The Bac Giang Student Association in Hanoi has held 5 programmes of “Accompany the students in examination 2019” at the senior high schools in the northern province of Bac Giang since April 6-20. The events take place in the districts of Viet Yen, Yen Dung, Lang Giang, Yen The and Luc Nam. Representatives of Bac Giang Student Association in Hanoi exchanges experiences on studying for examination to students at Ly Thuong Kiet senior high school (Viet Yen district). Accordingly, more than 6,000 students have the chance to share and discuss the effective studying method and experience for senior high school examination. Besides, the students are provided with the consultation, analysis and forecast about the labour supply and demand, experiences and trend to select the suitable educational facilities and jobs. Previously, the Bac Giang Students Association in Hanoi on April 6-7 conducted the program at Ly Thuong Kiet senior high school (Viet Yen district) and Yen Dung No.3 senior high school (Yen Dung district), providing the vocational instruction to nearly 2,000 students. (BGO) – The Study Encouragement Association in the northern province of Bac Giang has granted the scholarships to 7 difficult students at Bac Giang High School for Gifted Students achieving the good academic result.